Taylor Rental Center of Mundelein - Party Rentals, Equipment Rentals, and much more! We offer a wide variety of construction equipment and tools from lightweight everyday tools to heavy duty construction. View our complete rental options available by clicking here. We offer a vast array of party and wedding items for you to rent. Indoor and outdoor rentals available. See what we have available by clicking here. 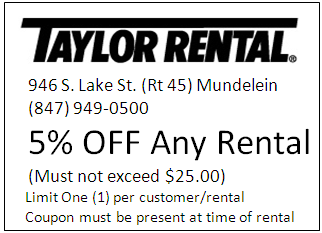 Taylor Rental of Mundelein now has a Renter's Rewards program for loyal customers! 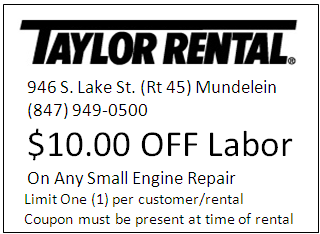 With your Renter's Reward card you can save big money on future rentals, so don't forget to ask for your Renter's Reward Card the next time you visit Taylor Rental of Mundelein! Moving accross Town? Taylor Rental has rental trucks, vans, boxes, furniture dollies as well as trailers. We've got what it takes to get your stuff to where it needs to be...and in one piece. Is your lawn mower not running? chain saw blade need sharpening? Besides having all of the rental tools to help you get your job done, Taylor Rental of Mundelein can also repair yours! Give us a call for current shop rates. We are an authorized Briggs and Stratton & Toro Dealer. Taylor Rental Center of Mundelein has everything you need to get the job done right. Whether you're moving, planning a party or occasion, fixing up the home or tackling a large project, we'll help make it a success. Rent the tools, Keep the advice! We are conveniently located on Rt.45 one half mile North of Rt. 60 in Mundelein. COUPON MUST BE PRESENT AT RENTAL. NO EXCEPTIONS!